Fostered with massive industrial understanding and competence in this sphere, we are engrossed in the realm of delivering to our customers Diya Wooden Rangoli. Owing to the wide experience of this domain, we are instrumental in offering Wooden Rangoli. While responding to the emerging requirements of the market, we have been providing MDF Jumbo Rangoli that is in huge demand among patrons. In order to keep pace with never ending demands of the customers, our company is instrumental in presenting excellent quality assortment of Wooden Beads Rangoli Designs. Wooden cutouts with satin cloth covering. This elegant rangoli is decorated with lots of diamond chains and golden metal ball chain. The use of kundan adds to its royal look. - This is wooden Rangoli.Folding parts in rangoli. use for all type of decoration.And home in function in door near by decoration. 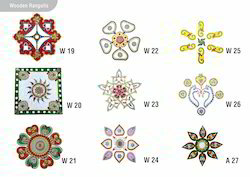 Handicraft Rangoli can be used during festivals and wedding ceremonies. 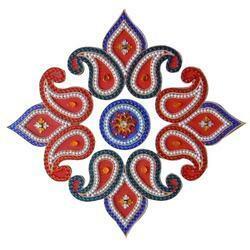 This beautiful rangoli can be placed on a corner table as a show piece or can be used as a centrepiece or a rangoli in Pooja Ghar during auspicious occasion. We offer decorative wooden rangoli in various standard and customized sizes to meet the decorative requirements of the customers. Our wooden rangoli are available in vibrant hues and traditional patterns. Our designers use their creative intellect to bring out exquisite patterns that are attractive and catch the eye of the customer.